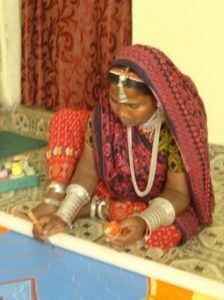 Bhuri Bai The petite Bhil artist from Pitol-Motabawri village in Jhabua is known for her drawings of the flora and fauna of the region. Bhuri Bai now works as an artist in the Adivasi Lok Kala Academy in Bhopal. She is a recipient of the highest award Shikhar Sanman (1986-1987) from the Government of Madhya Pradesh. In 1998, the Madhya Pradesh Government honoured her with the Ahalya Sanman.